If are interested in cooking, you may want to be familiar with various types of cookware. Why? Because there are a great number cooking utensils that are sold with a variety of materials, shapes, and colors that are designed to work according to the needs of cooking, so many options that might confuse you. As the variations are not merely about function but also the material used in making the utensils, it makes it even more complicated. But why should we care about it? Well, the material determines the safety and health of the cookware. 2 What Do You Need to Know About Ceramic vs. Stainless Steel Cookware? The main difference between ceramic and stainless steel cookware is heat absorption ability. Ceramic is perfect for low heat cooking and stainless steel can absorb high heat and ideal for high-temperature cooking. Another notable thing is, you can use any kind utensils in stainless steel while only wooden, nylon or silicone utensils perfect for ceramic. What Do You Need to Know About Ceramic vs. Stainless Steel Cookware? We have to pay attention to our cookware’s safety. Research shows that cookware can contaminate our bodies by releasing “toxins” such as migration of metals, plastics, or chemicals into our cooking. Every day when we cook, there is a part of our cookware that is eroded and reacts chemically when exposed to acetic acid, citrus acids, salt, spices, and the like and into our cooking and swallow it with the food we consume. The reason why we cannot feel the difference is because the meal has been given spices, salt, sugar, and others that eliminate the sense of metal we should be able to feel. Certainly, the accumulation of heavy metals in our bodies will have an impact on our health for both short and long-term. Perhaps you assume that cooking types of equipment are made only of iron and metal, but there are various materials used to make cooking utensils. There are cooking utensils made of metal, ceramics, glass, and others. Basically, we need to choose cookware made from quality materials that have thick enough to withstand fire temperature. Thin material causes uneven heat, making dishes cooked fast and leaving charcoal spots that can damage the cookware. Many believe that ceramics and stainless steel are the best options, but between those two, which is better? Using ceramic materials for cooking utensils are considered very safe, as it is made from organic material. Besides being safe, this type cookware is also not sticky, easy to clean, and able to deliver heat well. Moreover, the remains of the food will not make the ceramics sticky. Thus it will be quite easy to clean. However, two types of ceramics used in cookware are purely ceramic based and only the outer layer only. The first type is, of course, made fully from the heated clay which makes it easily crack. This form of ceramics is safe and does not contain reaction in the cooking process. The latter is also said to be very safe and similarly expensive but is not entirely safe because the utensils are produced by enamel layering a metal tool usually transmit iron. The enamel used is generally porcelain, which is processed from the glass. The finishing stage of a ceramic cookware process is done with polishing it with a glaze which is a kind of glass made of glass and soda. Ceramics and glass will also be harmful if accumulated in the human body with large quantities. Glass is easily broken so it is a very expensive investment and risky as a cooking utensil, also when cooking food sticky and burnt easily. Stainless Steel is considered the best and safest option for cooking as this kind of steel is a safe, clean, and hard steel type, so it does not pollute food or can react with food. Therefore it does not produce toxins. Although this form of cookware also contains a mixture of metals, but it will not contaminate the food as long as the coating is not scratched. Thus we had better not use a potentially damaging stirring spoon or washing tool. Stainless steel cookware is also anti-corrosion and durable. However, it has a low heat conduction property so that the thickness of the stainless steel layer is thinned, consequently, the cuisine is easy to burn and the heat is uneven. To solve this, we need to use a lot of cooking oil. A combination of stainless steel with a layer of copper or aluminum material can be another solution. 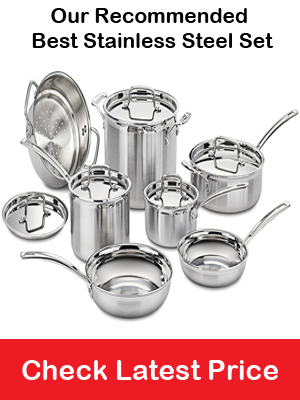 Most of the best quality stainless steel and used as cookware are grade 18/10. Because of the soft nature of this grade metal, when heated will expand and food becomes sticky. Then you are forced to cook with oil so the skillet is hard to clean. The presence of natural acids and salts contained in food causes a chemical reaction to the outside of the cooking area. Another drawback of this kind of cooking tool is that if it is exposed to very hot temperatures, the outside part of the cookware can be blackened, and exposure salt water continuously can damage the utensil. Also, the price of stainless steel cooking utensils is usually more expensive than other cooking utensils, such as aluminum. However, the price is relatively affordable considering the advantages. When choosing or buying a cookware, we should be taking into account the advantages and disadvantages of the tool. So should you have a stainless steel cookware? The answer depends on your cooking needs. For some people, equipment using stainless steel is the perfect choice for their kitchen needs. What about ceramic cookware? The weakness of this cookware is that it is easy to crack and break so we need to be extra careful when using it, but if you consider the safety, pure ceramic is better than the enamel, although then you need to pay more since pure ceramic is not too durable. Cookware made of pure ceramics is worth, though. It might be more expensive, but it won’t hurt if you invest for your health and family in the future. People mostly consider only the issue of price and the usage when buying cookware. It turns out that there are many dangers threatening behind the basic ingredients of the cooking tool and we never realize that. We should think wisely since it gives effects to our health. Both stainless steel and ceramic materials are quite safe but when you buy the original. Thus, you need to sacrifice more since it will be way more expensive than enamel materials, but again, health is everything.